As we approach Opening Day, here's a question worth pondering: Who's the most exciting star on the New York Yankees? It could be Aaron Judge, the incumbent American League Rookie of the Year. Judge hit an American League-leading 52 homers last season and was the Junior Circuit MVP runner-up. It could be Giancarlo Stanton, the reigning National League MVP. The Yanks added him in a trade this winter after he swatted 59 home runs for the Miami Marlins. Stanton and Judge will form a fence-clearing tandem in the Bronx that'll draw inevitable (if premature) comparisons to franchise legends Babe Ruth and Lou Gehrig. Pop your popcorn. Yet, there's another member of these burgeoning Bronx bombers who could surpass his larger-than-life teammates: catcher Gary Sanchez. Sanchez burst on the scene in 2016 with 20 homers and a 1.032 OPS in 53 games. Last season, he scoffed in the face of a sophomore slump with 33 home runs, a .531 slugging percentage and an All-Star appearance. How much higher can the 25-year-old rise? Sanchez is raking in the Grapefruit League with 11 hits in 33 at-bats, including two doubles and four home runs. Stanton is 8-for-35 with one home run and 13 strikeouts. Judge is 6-for-29 with a homer and 11 whiffs. Exhibition stats must be taken with a small-sample grain of salt. When you add Sanchez's early-career track record, however, his spring output is tantalizing. 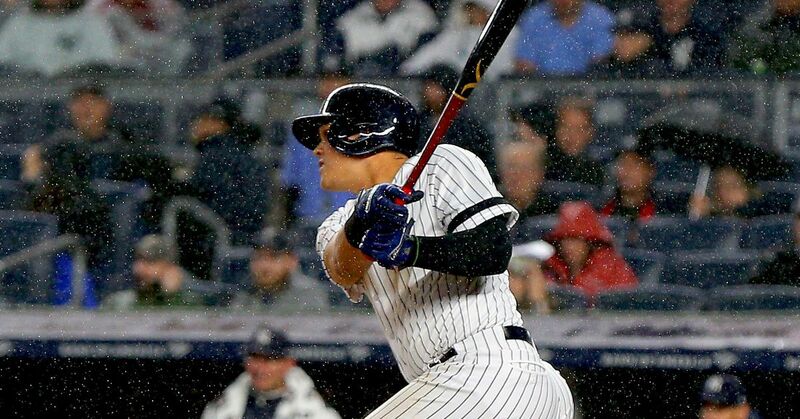 "Love what I'm seeing from him," new Yankees skipper Aaron Boone said, per ESPN.com's Coley Harvey. "Right now, he's in a great frame of mind mentally. The program he's on, the work he's doing, the quality of his work day in and day out has been excellent, and I feel like it's shown up in games." FanGraphs' Depth Charts projection foretells 31 home runs and a .265/.328/.513 slash line for Sanchez. The Yankees would happily take that, but it feels more like Sanchez's floor than his ceiling. It's worth remembering that Sanchez plays a premium defensive position. His receiving skills have developed since his MLB debut, though he did lead the game with 16 passed balls in 2017. On the plus side, he's gunned down 39 percent of would-be base stealers during his time in The Show. His primary offseason objective was improved defense, per Newsday's Erik Boland. Apparently, it's paying dividends. "I don't mean to be hyperbolic about it, but I think he's been catching great," Boone said, per Lou DiPietro of the YES Network. "His work in the dirt, his pitch framing, his commitment to his pitchers to game planning...all that has been great, and I think he's in a good place heading into the season." This could be the year Sanchez wrests the title of best catcher in baseball from the San Francisco Giants' Buster Posey. That's no small feat. Judge and Stanton will get theirs. Assuming they stay healthy, they could combine for 100-plus home runs as the Yankees attempt to regain division supremacy from the archrival Boston Red Sox. Sanchez may end up surpassing both. Stanton could crack 60 homers, but he'll be primarily a designated hitter. Judge will launch his share of dingers while patrolling right field. Sanchez, though, could approach them in the power department while playing a more important and physically demanding defensive position. Last season, Sanchez had a 74.0 percent contact percentage. Stanton's was 70.5, while Judge's sat at 67.4. A better contact percentage often generates a higher batting average and more clutch hits. Not surprisingly, Sanchez had the best average of the three with runners in scoring position in 2017. Again, that's not to disparage Stanton and Judge. They're great hitters. The Yankees have an embarrassment of riches. The idea of Sanchez as the sleeper pick for best Yankees position player isn't far-fetched, however. Just ask New York left-hander CC Sabathia. "Sanchez is probably the best hitter in the lineup," Sabathia said, per Harvey. Those are bold words, but Sabathia has seen enough hitters to know what he's talking about. Sanchez has been a special player since he debuted in pinstripes. After his breakout rookie performance, I spoke to him through an interpreter. Sometimes, those types of interviews can be stilted. Instead, Sanchez's answers were nuanced, forthcoming and self-assured. "Honestly speaking, this first time around, I felt confident against every pitcher I faced," he told me. Maybe that sounds like bragging. Given what Sanchez has shown during his time in the big leagues and what he's teased this spring, it sounds more like a harbinger of huge things to come. All statistics current as of March 19 and courtesy of MLB.com and FanGraphs.